Agile project management can be a great help in a wide variety of projects, but if it is not fully understood, there will be problems. In agile, there are unique terms and ways of working that can be bewildering for those new to the methodology. Unfortunately, if the whole team is not familiar with the agile framework and its terms, things can become inefficient. Two such potentially confusing terms are product backlog and sprint backlog, both of which are essential for planning and prioritizing tasks in a project. The product backlog is compiled of all the things that must be done to complete the whole project. But it’s not just a simple list. An effective product backlog breaks down each of the items on the list into a series of steps that helps the development team. There must be a duration, so the team knows when to start the task and how long they have until they must finish it. This process can be expedited with the help of a task management software. But even if it’s been planned out, the product backlog is not set in stone. Like most aspects of project management, there are going to be changes. Flexibility is crucial. The project bends or it breaks. The same is true for the product backlog, which is always in a state of flux and adjusting to the work on the development team. At best, that means the product backlog is shrinking, because once a task is completed, it should be removed from the product backlog list. Sometimes, however, as the project grows, new items are added. The sprint backlog is like a subset of the product backlog. The sprint backlog comes from the product backlog, but it contains only that item, or those items, that can be completed during each sprint. Think of it as the marching orders for the team as they go off on their short sprint. This is a piecemeal way to chip away at the many tasks on the product backlog. The complexity of the project will determine the sprint backlog, but overall the idea is to dedicate the team only to those tasks that can be completed during the sprint. Of course, if it is a complex project that sprint backlog can also grow in complexity and length. 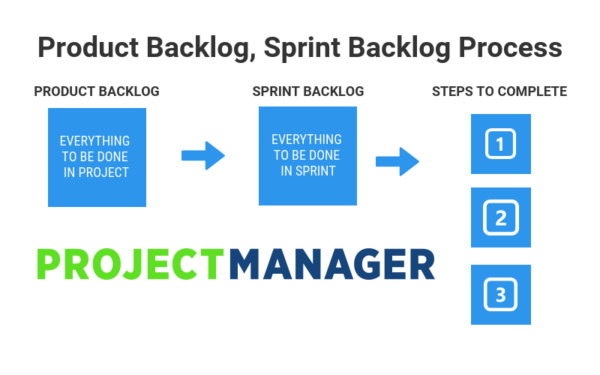 Unlike the product backlog, though, the sprint backlog is unchanged during the period of the sprint. It can be changed, but only during the sprint planning meeting. Once agreed upon, the items and steps to complete them are frozen for the length of the sprint. If there are items left unfinished by the end of the sprint, they will be added back to the product backlog and addressed during the next sprint. How Do the Product Backlog and the Sprint Backlog Work Together? It’s clear that for the team to work effectively, they must understand the difference between a product backlog and a sprint backlog, and how these two terms interact to move the project forward. Therefore, during the planning meeting, everyone on the development team should discuss what must be done and how it will be completed. There is the product backlog list and the items from that list are then moved to a sprint backlog list. It’s at this point that each item on the sprint backlog is broken down into tasks, or steps, that will be taken to complete the item. All of this must be clearly communicated and agreed upon, for, as noted above, once started there can be no changes to the tasks and steps needed to complete them. What Does an Effective Product Backlog Look Like? While the concept of a product backlog is simple enough, it can be unwieldy, as it’s composed of literally everything that must be completed to bring in a successful project. One must know the project inside and out, and then have the skill set to break each of those individual tasks into a series of steps that can then be assigned to the team, who must not only complete it but understand it. The product backlog is created by the product owner, who is the project’s key stakeholder and therefore has a full vision of the project. The product backlog is a guide for the agile team and therefore must be written out clearly and simply to avoid any miscommunication or misunderstandings. To make the process as thorough as possible, it must be organized, and each item explained in full as part of the plan to move successfully through the project. The product owner knows what the customer wants and can work backwards from there to make sure everything is done to meet that goal. That’s the product owner’s lodestar, and if the customer’s interests are always leading the backlog, the work will be effective. What Does an Effective Sprint Backlog Look Like? By definition, the sprint backlog is easier to create. It’s smaller, more digestible, but that doesn’t mean it can be developed without thinking strategically about the capacity of the team and resources at hand. If you give a team more than it can handle, the product gets bogged down. Teams might feel they can do more than they can, so it’s up to the development team and the scrum master, an expert in scrum methodology who guides through skill and experience, to know what the team is able to do by having a good estimation of their ability. Remember, a sprint is usually only over a two-week period, though this time can differ depending on the size of the team and project resources, so the sprint length is another variable to determine. The sprint, while short, must not over tax the team or force them to rush and produce a sloppy deliverable. Therefore, as the sprint backlog and the steps necessary to complete are being figured out by the development team, brainstorm with them, and open up a dialogue to determine what is feasible in terms of a strategy for the sprint. Before moving a task from the product backlog to the sprint backlog, the product owner and scrum master must be sure the team is clear on the steps needed to complete that task. Get them to sign off, so there is no confusion that could cause trouble during the sprint. It’s always a good idea to prioritize the tasks on your product backlog from crucial to less important. This is a task for the product owner, being the one most intimate with the needs of the stakeholders. While the scrum master would seem a logical choice to help with prioritizing, it’s important to remember that the scrum master is only there to help with the process, not with the product. But that’s another term and process for another time. With knowledge of the product backlog and sprint backlog, you’re well on your way to using agile to help with your project management. It’s a great organizing principle, and one more arrow in your quiver. When creating a product backlog and sprint backlog, it’s crucial to have the right tools to organize, prioritize and assign all those tasks. ProjectManager.com is a cloud-based project management software that has a real-time dashboard to track the progress of the project and offers a robust online platform for teams to collaborate during sprints. Try it today and see for yourself with this free 30-day trial.